Early-onset dementia: symptoms and the importance of early diagnosis. Home Health Early-onset dementia: symptoms and the importance of early diagnosis. Insulin could slow Alzheimer’s pregression. Brandon Marshall diagnosed with Borderline Personality Disorder. People should be aware of early-onset dementia, learn what its symptoms are and how important is the early diagnosis. 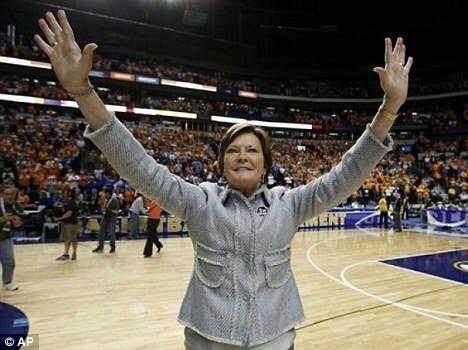 Pat Summitt, 59, Tennessee women’s basketball coach has been recently diagnosed with early-onset dementia (Alzheimer’s type) when she visited the Mayo Clinic in Rochester, Minnesota. [googlead tip=”patrat_mediu” aliniat=”stanga”]Last May, Mayo Clinic doctors performed a spinal tap and other tests that eventually produced the diagnosis of early-onset dementia. Pat Summitt initially chalked up her memory problems to side effects from medicine she was taking to treat rheumatoid arthritis. Pat Summitt talked about her early-onset dementia diagnosis. Early-onset dementia is a term used for progressive dementia that begins before age 65, so, to be aware of its symptoms and visiting doctor for an early diagnosis are crucial. [googlead tip=”vertical_mare” aliniat=”dreapta”] Linda Johnson, director of programs for Alzheimer’s Tennessee Inc. has some hope to offer to the people who have been diagnosed with early-onset dementia and call her office for help and : better treatments, education and support. Over the past fifteen years, medications have improved for people diagnosed with “early-onset Alzheimer’s,” or “early-onset dementia”, a term used for progressive dementia that begins before age 65. Most people diagnosed with early-onset dementia are in their 40s and 50s, though some are in their 30s. It accounts for only 5% to 10% of all Alzheimer’s disease cases. Let’s see some of the early-onset dementia symptoms. Early on, people may have difficulty with language, mixing up words. Later, they may fail to recognize something they should: a favorite restaurant, an article of clothing. They may start to have difficulty performing complex tasks, such as bookkeeping. “Many times, it’s the co-workers of people with early-onset dementia who notice something is wrong, because most people are taxed with more complex tasks at work than at home,” Linda Johnson said. “It’s very important to get a diagnosis as soon as possible,” she said, to rule out other things that sometimes cause dementia — vascular problems, for example, some blood clots and tumors, iron deficiency. Starting medications, which can slow memory loss and other symptoms, ”EARLY is key”, Linda Johnson said. She knows a person who lived with Alzheimer’s for 25 years, another who had only 18 months. 10 years seems to be average. About 50% of early-onset dementia cases are linked to the mutation of certain genes, which means people can have a hereditary disposition to the disease. The other 50% of cases are similar to later-onset Alzheimer’s, and it’s not clear why they begin earlier in life.